Barong Dance Bali is a theatrical Balinese traditional dance. It is telling the story of the fight between the White Magic and Black Magic from Mahabharata Story. The story in general are telling us when the mystical animal “Barong” fight “Rangda”. Rangda learn black magic and doing cruelty in the world. 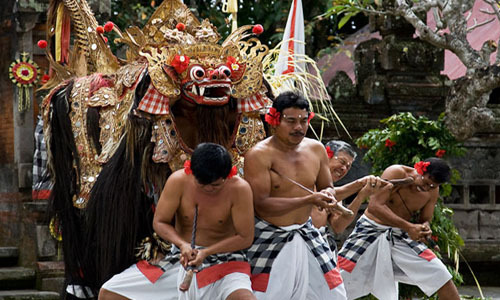 Barong Dance performance has become one of the interesting tourist attraction in Island of Gods. The tourist that interested with cultural side of Bali always enjoy the performance. But with explanation of the dance details of course. Our Bali tour driver will be very happy to accompany and explain you about culture. The performance of Barong Dance is in the morning time around 9.30 – 10.30 am. It performs at Ubud, Tohpati, Kesiman, and Suwung Village at Sanur. We commonly suggested to watch this dance in the beginning of Ubud Tour or Kintamani Tour because the location of the performance in on the way to that area. It is really interesting attraction to begin the Bali Tour Itinerary. To follow the storyline of dance, let’s have a slight information of each Barong dance Bali main character that will show up along the story. “Barong” is a mystical animal with four legs that looked like a lion that live in the jungle and well known to have a great power of White Magic. “Sahadewa” is the youngest Pandawa Brothers that is the main character that fight the evil and later on will become the Barong itself to fight the most powerful Rangda. “Monkey” is a good friend of Barong and stay at the jungle as well. They are always making fun together but both also do not like evil thing happened in the world. “Kunti” is a queen and mother of Sahadewa and Pandawa Brothers as well. She made a promise to sacrifice Sahadewa to Rangda so Rangda will stop making more chaos in the world. “Vice Minister and Underlings” are the people that serve Kunti and having duty to advise any act that Kunti should take. “2 Young Ladies” are the underling of Kunti as well that show up in the very beginning of the story. “Siva God” is the husband of Durga Goddess. He is the God that control the death of the human and other living things. He showed up to bless Sahadewa with power and mortality to fight the demonic Rangda. “Rangda” is an evil women that earning power to control evil by praying. And she become the underling of Durga Goddess that rules the hell. She use the power she earned to do Black Magic and cruelty in the world. “Kalika” is the main underling of Rangda that will become the next Rangda. Kalika’s Rangda even more evil and powerful than the first Rangda itself. “Wild Pig” is the first and the lowest evil shape of Kalika. “Big Bird” is the second transformation of Kalika with medium level of black magic power. “Kalika’s Rangda” is the final and the strongest evil Rangda. Some evil also appear that become the underling of Rangda. Barong Dance Bali Storyline is start with the appearance of 2 young ladies. They are the underlings of Kunti. They heard about the promise made by their queen to sacrifice Sahadewa to Rangda. Because they are not agree with that plan, they are going to have journey to have a meeting with the Vice Minister of Kunti. They would like to discuss how they advise their queen to cancel her promise to Rangda. Without anybody notice, the evil and underlings of Rangda are following them. On the same time, Barong and the Monkey was in jungle and having fun like usual they do. Then they realize that there are several man with evil that follow the journey of the 2 ladies. Barong and Monkey scared them away so the ladies would not be distracted and continue their journey to meet the Vice Minister. The underling of Rangda reported the situation to Rangda that the ladies and Vice Minister would like to encourage Kunti to cancel her promises. Rangda ordered the evil to take control of Kunti’s and her underlings mind later when they have a meeting. Rangda give specific power to the evil so the evil can change the mind of Kunti and her underlings. The 2 ladies have spoken the issue to the Vice Minister and all of them agree to encourage Kunti to cancel the promise. Together, they meet Kunti and start to encourage her. During their meeting, the evil sneaking behind them without anybody noticed. Then the evil use the power to take control of all the people. All of sudden, everybody getting very angry to Sahadewa without any reasons. Their emotion changes everything and they are willingly sacrifice Sahadewa to Rangda. Kunti summoned Sahadewa, then order her underlings to tied Sahadewa in front of Rangda’s Palace. They leave Sahadewa there just accompanied by one soldier. Before the dark rises, God of Siva appears. The God of Siva is blessing Sahadewa with mortality and power to fight against Rangda. He bless Sahadewa because he do not like how Rangda using her power to do cruelty in the world. Especially the power that Rangda is from Durga Goddess, wife of Siva God himself. When dark rises, Rangda appears from her palace. Rangda are only active at the times together with her underlings, all the evil. Rangda is directly want to kill Sahadewa as soon as she saw Sahadewa. She wants to kill him as a sacrifice to improve her power. Many times already she tried to kill Sahadewa but all her efforts did not hurt Sahadewa at all. Sahadewa that just realized that he got blessed by Siva God, fights back and Rangda’s power is useless against him. Then Rangda asking for apologize and Sahadewa giving her apologize. Because he saw Rangda really want to change, he also blessing her with peaceful death to give her another chance to be better on the next life. Seeing what happened to Rangda, Kalika which is the main underling of Rangda asking for the same thing from Sahadewa. But Sahadewa rejected because he feels that Kalika’s heart is really evil even more than Rangda itself. Rejection from Sahadewa makes Kalika angry and now she attack Sahadewa. The fight between them is easily taken control by Sahadewa then Kalika transform her shape into several animals. The first transformation, she become a wild pig. This transformation is the lowest grade of evil shape and it only need the ordinary soldier of Sahadewa to take her down. Kalika transform her shape again into big bird with higher level power. Sahadewa has to fight her by himself but with his human shape is enough to win against her. Finally Kalika reach the highest level of evil transformation which is a Rangda. Kalika’s Rangda shape is very strong. Sahadewa with his human shape is not able to fight against her anymore and lose the fights. To fights Kalika’s evil shape, Sahadewa has to transform his shape as well. He transform his shape into Barong. In this shape he can match the power of Kalika in Rangda shape. Their fight is equal in term of power and Barong is assisted by some soldiers to defeat Kalika. That soldier has no magic power so they are easily got beaten. With his magic power, Barong resurrected his soldier. Once they were resurrected, Kalika give magic spell that taking control of those soldiers mind. Kalika order those soldier to suicide themselves by stubbing their own chest with their own “Keris”. Keris is traditional Balinese sword that has curvy shape in medium size. Seeing the danger is coming to his soldier, Barong put another spell that protected the body of those soldier. The scene when the soldier suicide is also performed at the last scene of the performances and this is the most exciting scene from all the performances. The dancer that act as the soldier is suicide in front of our eyes and the Keris that they use is an original Keris as well. The Barong Dance Bali is a spiritual dance. So during the performance there is some offering. It is to invite the spirit of Barong and Rangda to come to the stage. The last act also the prove that their spirit is appear during the performance and that make the last scene of the dance that is very dangerous but we believe the spirit of Barong is protecting the body of the dancer who act as the soldier. 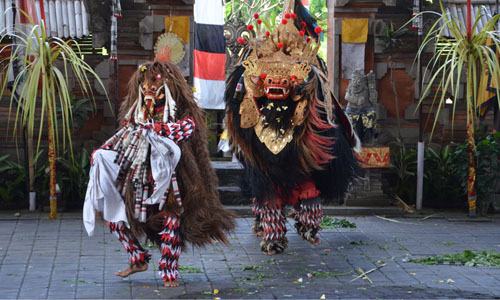 Until the last scene Barong Dance Bali storyline, it is not stating which is the winner of the fight. That is telling us about the “Rwa Bhineda” lesson. The lesson is the good is always come with the bad. The fight between spirit of Barong and Rangda is mortal. The lesson is teaching us to be very careful in this life because there is always the good and the bad around us and even inside ourselves. It depend on us which one we will be either good or bad. There are many tourist attraction other than Barong Dance in Bali, such as Bali Adventure Activities, Bali Water Sport Activities, or other tourist sites. Come and join Bagus Tour Service with Bali Private Tour.